FlexBind® hinged sheets create beautiful lay-flat books! Just print (Digital laser), trim and bind! Versatile sheets can be imaged and bound our BooXter Stitch or Perfect Binding Families of binders! 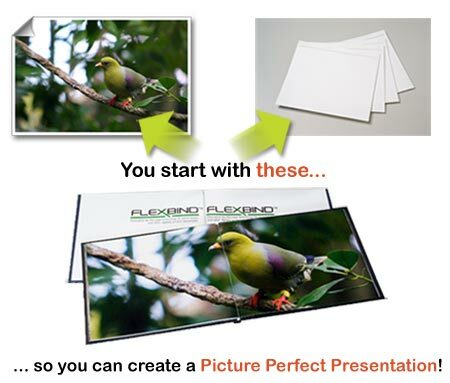 FlexBind® is a digital photo sheet or “page” product. It is not a binding system or print process. Available in different base stocks and sizes the sheets have an integrated, flexible hinge that allows even the heaviest weight sheets to lay completely flat when properly bound. The advantages include the ability to digitally image directly on the page and immediately bind the volume producing a very high quality “coffee-table” book. Â What are the advantages of using FlexBind® pages? FlexBind®digital pages transform printed material into incredibly high quality, professional bound volumes for wedding, sports, travel albums and other digital scrap-booking uses. Printers and labs can easily enter new, expanding digital book and color markets. Produce beautiful, value-added bound volumes with high quality, heavyweight archival pages that will become treasured keepsakes. I have seen some other papers that claim to lay flat/panoramic, so what is the difference with FlexBind®pages? FlexBind® digital pages do no require any additional process to finish the book: Simply print, trim to bleed and bind. Just like any other paper you print in your digital press, but with the built in hinge, the paper lays completely flat! With no additional work, you can make you photo books fast & easy, but deliver an exceptional high end product! What paper, weights and sizes are available? Medium (6 pt.) to heavyweight (14 pt), matte coated, high quality digital papers. FlexBind® sheets are available in various sizes to produce common book sizes. What types of digital presses are compatible with FlexBind®photo sheets? FlexBind® sheets have been tested on the major digital production presses. Contact Us to receive more information. Can I print on both sides of the sheet? Yes, sheets can be imaged on both sides and on top of the FlexBind® hinge to produce a full spread with minimal image loss in the gutter. Can FlexBind® sheets be laminated, UV coated or glossed? Yes, laminate, UV coat or gloss as you would plain paper. What types of binding can I use? How should it be stored and handled?